How many animals were used in Poland and Finland in 2016? Speaking of Research try to keep on top of the latest statistics coming from governments around the world. This post will look at the 2016 statistical releases in Poland and Finland. Finland reported that 105,615 procedures were conducted on animals in 2016, a 9% rise from 2015. According to statistics provided by Finnish authorities (but not required by the EU), 168,548 animals were “bred and euthanized without procedures”. This figure is likely to include both surplus animals bred, and animals bred to supply tissue samples for in vitro studies (but not genetically altered and not undergoing any procedure). The rise in numbers mainly comes from the increases in mice (+16%) and birds (104%). This is the second year in which the number of birds used has doubled. Proportionally, Finland uses more dogs than in most countries – 3.8% vs around 0.5% in other EU countries. However, on closer inspection, it turns out that 3,582 procedures were taking blood samples from pet dogs to study genes involved in canine diseases, and 244 procedures were pet dogs participating in (veterinary) patient studies, leaving only 135 dogs used in laboratory settings (nearly all in toxicity and safety tests, nearly all of which were of mild severity). Similarly, all 259 procedures on cats were blood samples from pet cats to study genes involved in feline diseases. Most research was conducted on mice (66%), rats (12%) fish (10%) or birds (7%), together accounting for 95% of all research procedures. No primates were used. 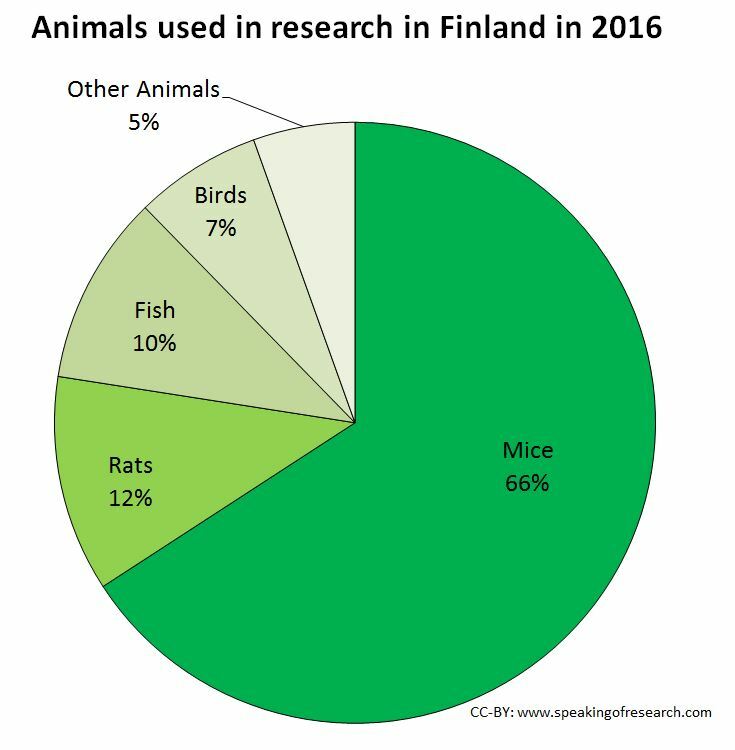 Trend over time in animals used in research in Finland. Click to Enlarge. Over the last decade, the number of animal procedures in Finland has been falling, approximately halving over ten years. Given the relatively small numbers of animals used in Finland (numerous US and UK universities use more animals in a year than all Finnish institutions put together), changes in overall numbers can be the result of just a handful of studies starting or finishing. 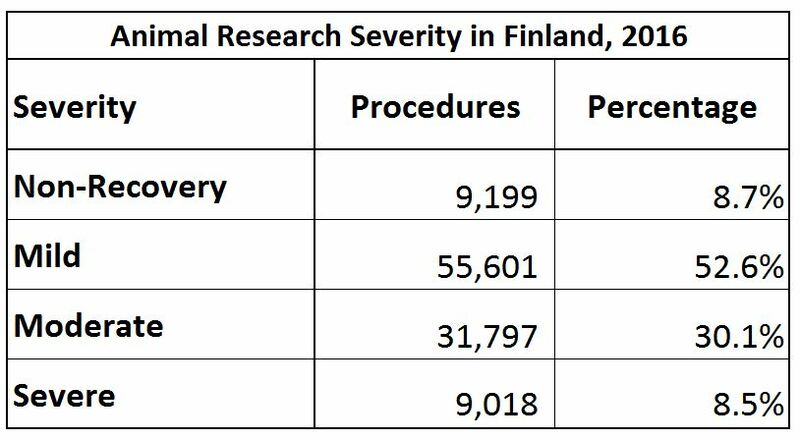 Finland, like all EU countries, reports the severity of every procedure after they have been completed. 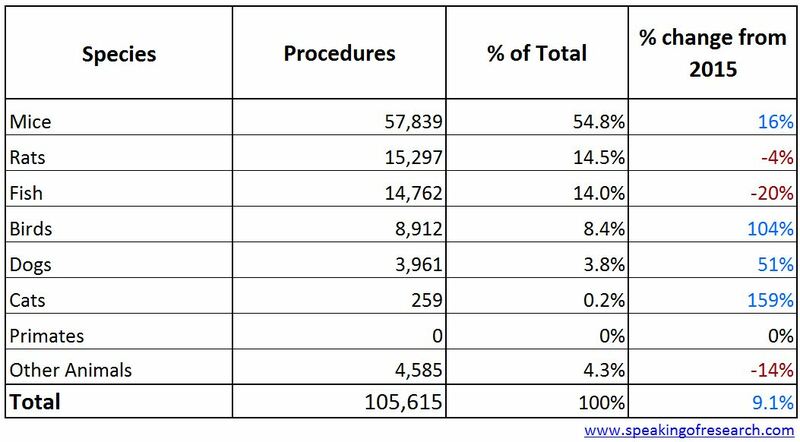 Mild and non-recovery accounted for 61.3% of procedures (60.3% in 2015), moderate was 30.1% (down from 33.9% in 2015) and severe was 8.5% (up from 5.8% in 2015). 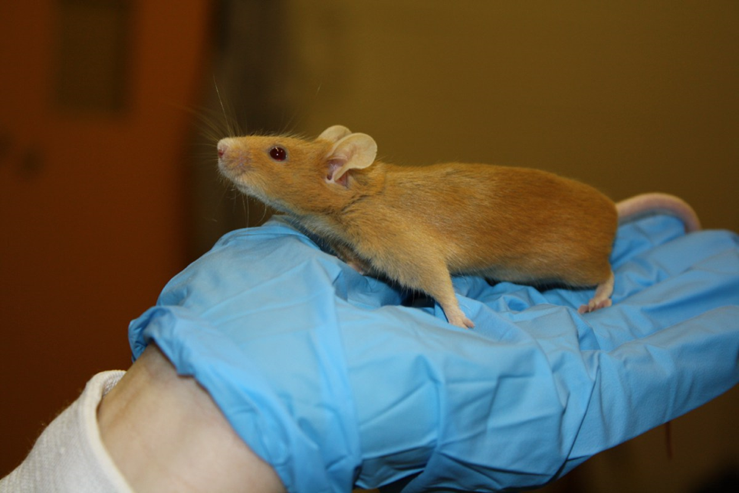 All but one severe procedure was on mice and rats (the last was on pigs). 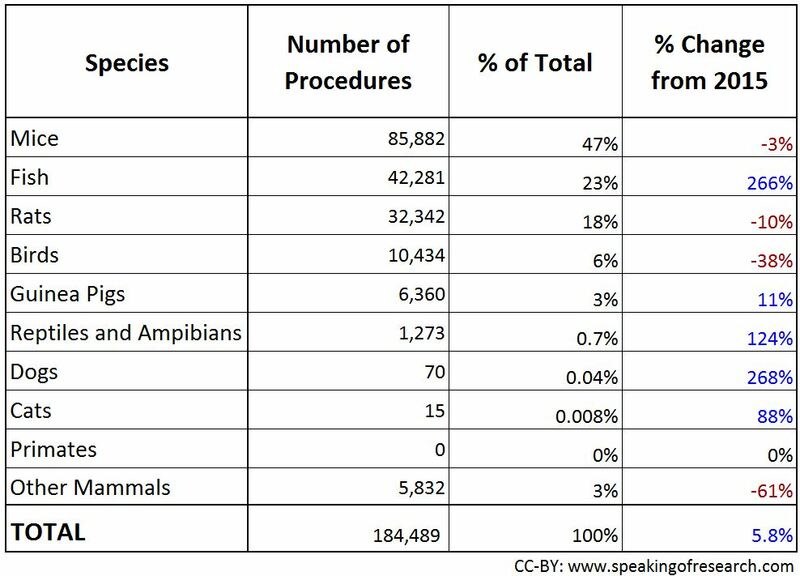 Finally, 41.1% of procedures involved genetically altered animals (mostly mice and fish), 58.9% did not. Mice are the most common species of animal used in both Finland and Poland. Poland reported 184,489 procedures on animals in 2016, a 6% rise from the previous year. It should be noted that while we compare to 2015, there were numerous issues relating to that statistical release and as a result these “changes from 2015” should be taken with a pinch of salt. The biggest rise has been in fish, which rose 266% from 2015. This was slightly offset by falls in mice (-3%), rats (-10%) and birds (-38%). 93% of all research in Poland is on mice, rats, birds and fish – similar to most other EU countries. Prcoedures on dogs and cats together add up to less than 0.05% of research (85 procedures), and there were no procedures on primates. 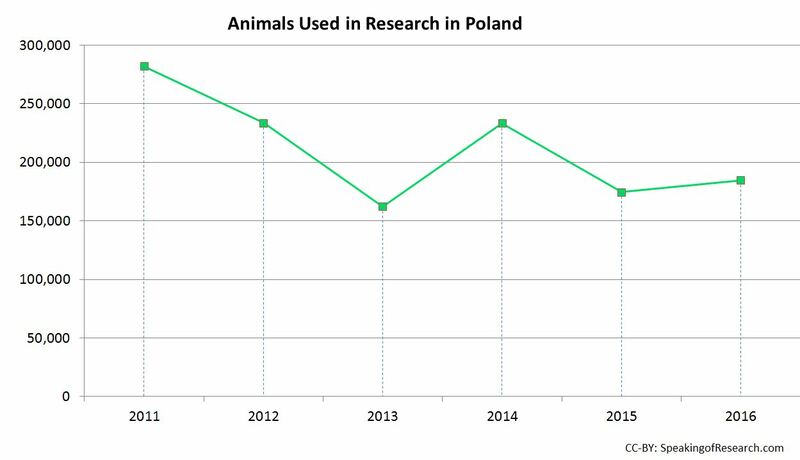 Trend over time in animals used in research in Poland. Click to Enlarge. There appears to be a downward trend in animal research over the last six years, though errors in previous data should mean that readers should take figures with a pinch of salt. Like Finland, given the relatively small numbers of animals used in Poland (numerous US and UK universities use more animals in a year than all Polish institutions put together), changes in overall numbers can be the result of just a handful of studies starting or finishing. 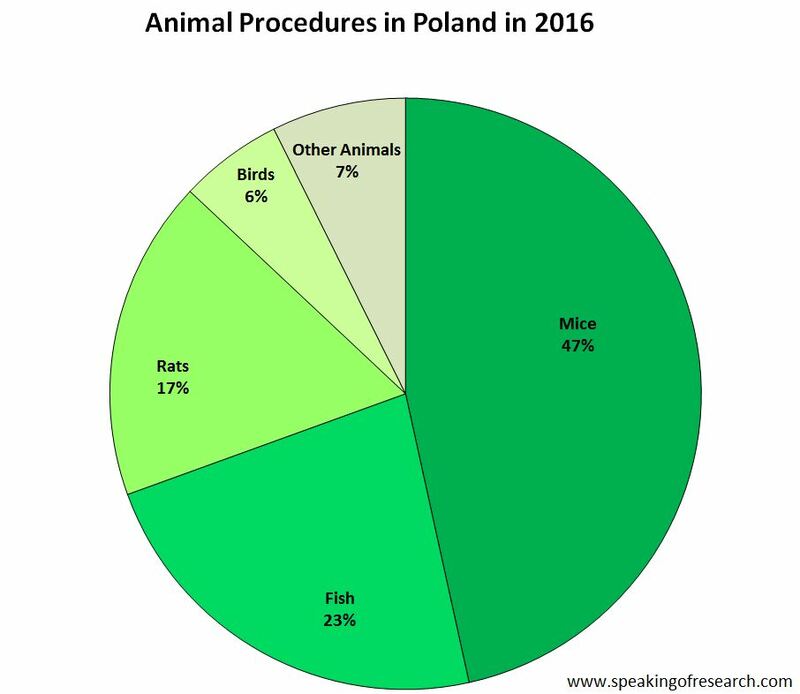 Severity of animal research procedures in the Poland in 2016. The total number of procedures is higher than previously mentioned as it includes 1,210 animals that had already been involved in previous studies. Poland reports the severity of every procedure after they have been completed. Mild and non-recovery accounted for 51%% of procedures, moderate was 26% and severe was 23%. The proportion of severe experiments is higher than in most other EU countries. This may be a result of slightly different guidelines currently in Poland for classifying severity. Posted on October 3, 2017 May 9, 2018 by EditorPosted in News, StatisticsTagged animal statistics, finland, poland, Statistics.